amount of homey comfort to the table. 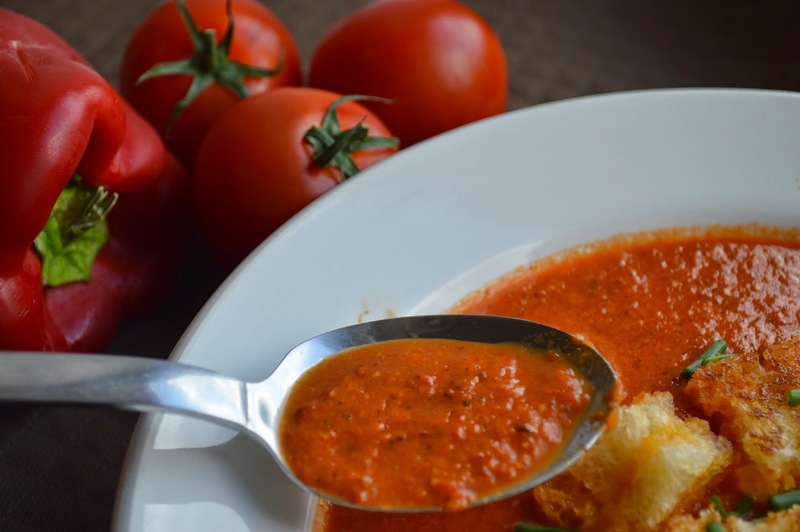 My husband grew up with tomato soup and cheese sandwiches as a Sunday evening tradition. He still loves this meal and the nostalgia it brings. And really, didn't all of us who grew up in America have this meal during our childhoods? 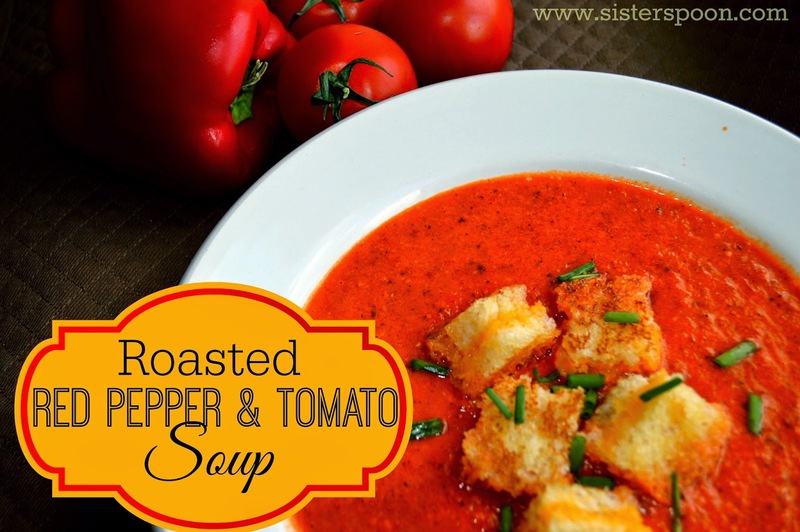 While this soup hasn't reached the status of "weekly tradition" at our house, (I like experimenting too much to do the same meal every week), I do like the addition of roasted red pepper better than plain tomato soup. It takes it up several notches above canned soup. 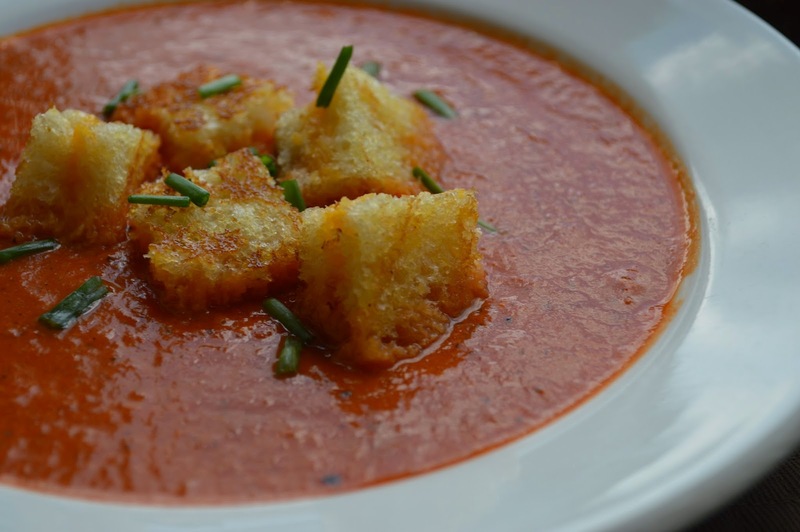 And, for the finishing touch, add some grilled cheese croutons or serve with crusty bread. This is a fairly quick and easy meal, perfect for when you are busy with refugees, a threat of Russian invasion, or a ton of laundry and fighting siblings. It also looks lovely. PS No dairy or gluten in this one, for those who are concerned about those things.... just veggies, broth (you can use vegetable broth if you like), and a little oil and spices. 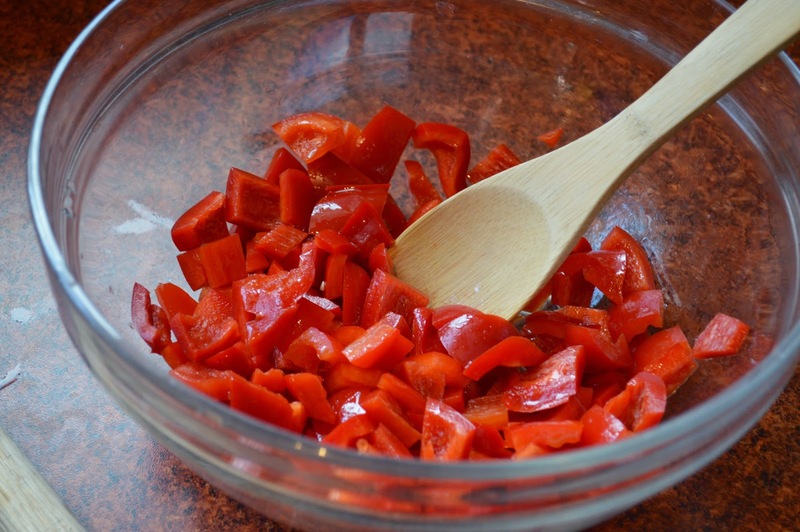 First, turn your oven onto broil, and while it's heating up, chop your red peppers. Remember to remove the seeds and the white membrane inside. 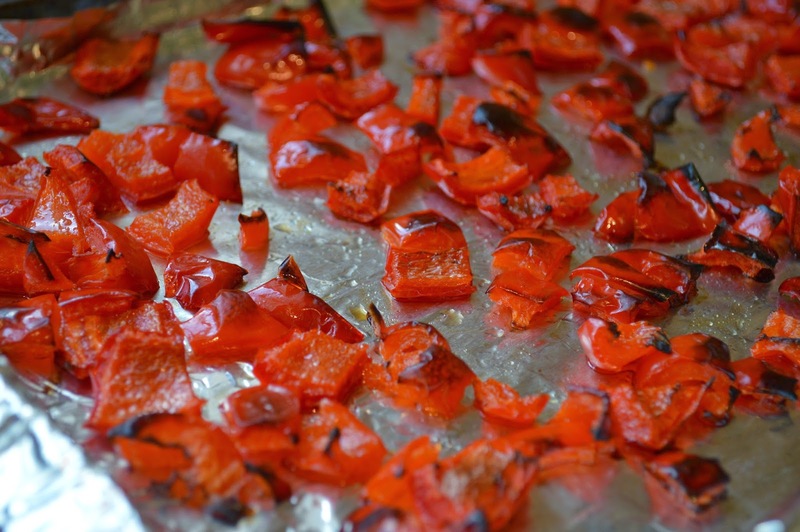 Toss the peppers with a bit of oil, then spread them out on a foil-lined pan and place in the oven. Broil for 10-15 minutes, remove when the edges of the peppers start to blacken. Set aside for now. Now we prep everything else. Dice the onion and tomatoes, and mince the garlic. 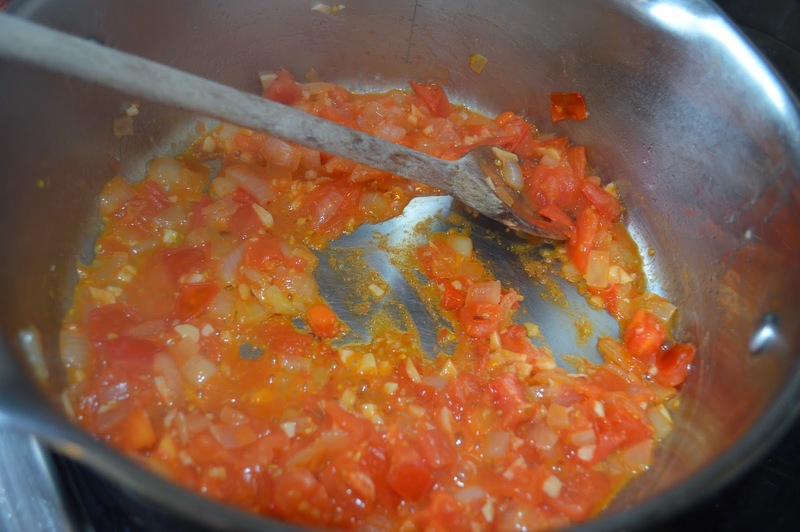 Saute the onions, tomatoes and garlic in a bit of oil in a soup pot. 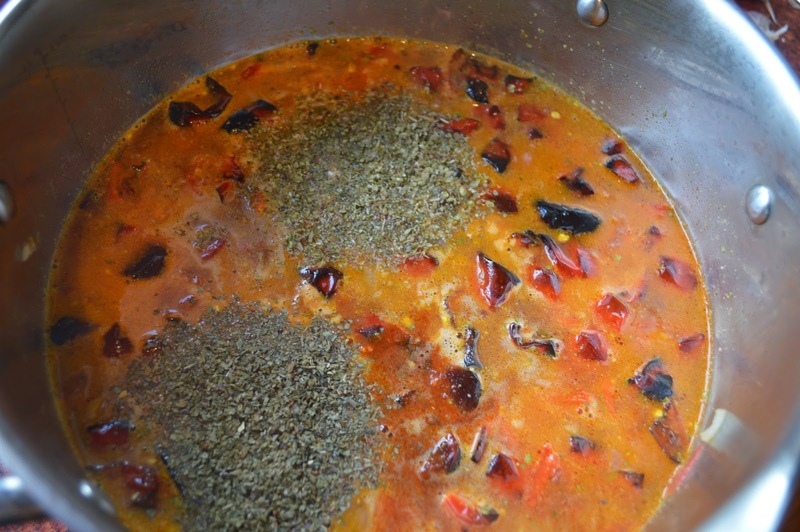 Add chicken broth, roasted peppers, and spices. Trust me, it'll look better when it's finished. Let that simmer for about 20 minutes. You can take this time to grill up some cheese sandwiches to accompany your delicious soup. Or, let's be honest, kill 20 minutes on Pinterest. Now the soup looks like this. The veggies should all be nice and tender by now. If you have one of these babies (an immersion blender), pull it out. If not, go get one. No, just kidding. If you don't have one, you can just use a regular blender. It's not necessary to get this perfectly smooth. You want it all blended through, so there are no big chunks of anything, but a little bit of rustic texture is good. Serve with grilled cheese croutons, if you so desire. (Hint: just make some grilled cheese sandwiches and cut them into chunks). Enjoy a taste of nostalgia. But better. 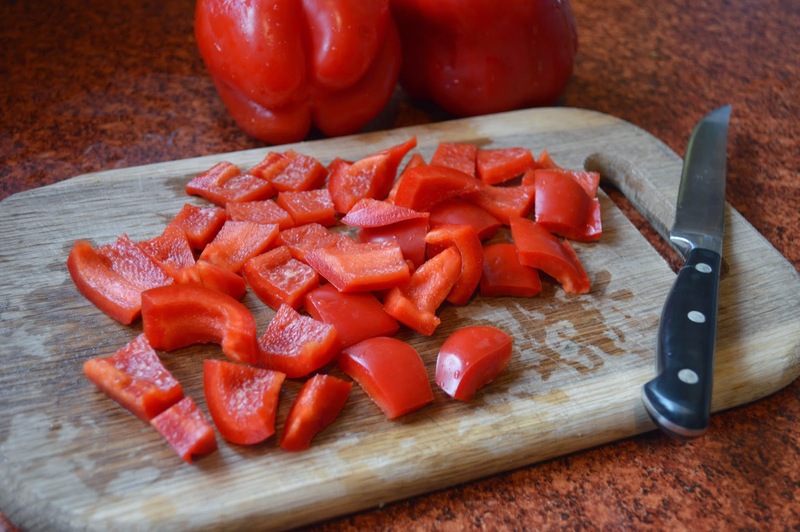 Chop bell peppers and toss with 1-2 Tablespoons oil. Spread in a single layer on a foil-lined baking sheet. Put in the oven to broil. Remove the peppers when the edges start to blacken. Set aside. Dice onion and tomatoes. Mince garlic. In a soup pot, heat 1-2 Tablespoons of oil. 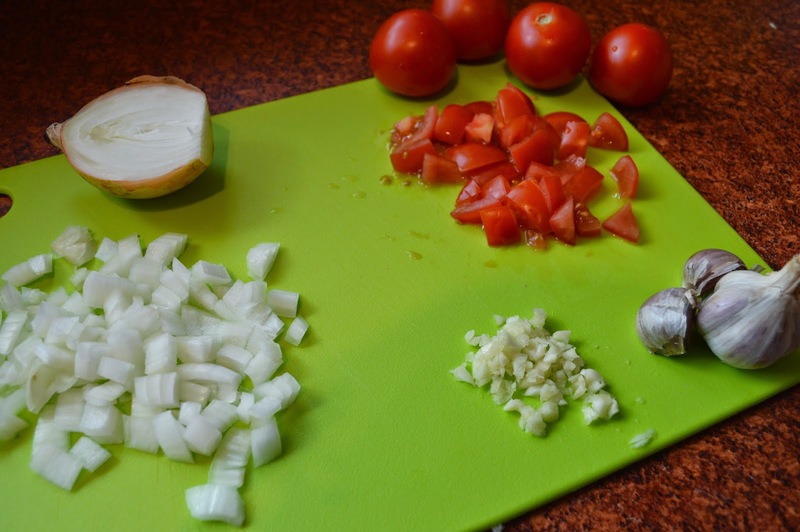 Saute the onions, tomatoes and garlic until the onions are tender and translucent. Add chicken broth, spices, and roasted peppers. 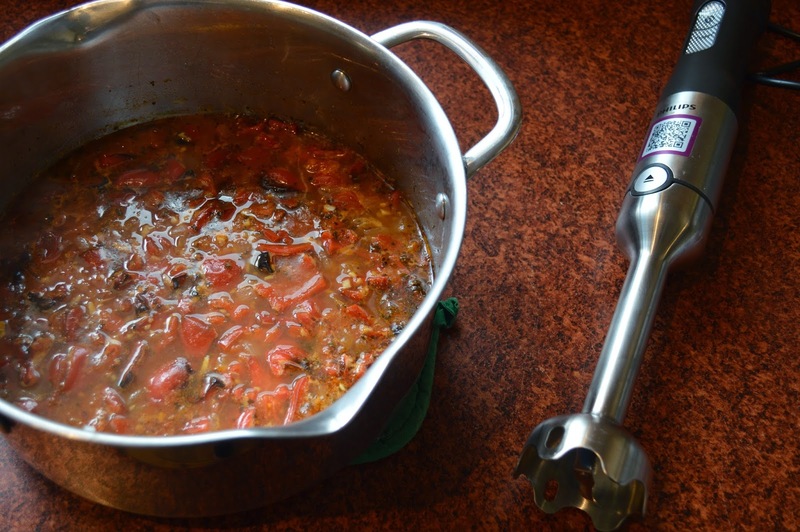 Turn heat down to medium-low and simmer for 15-20 minutes. 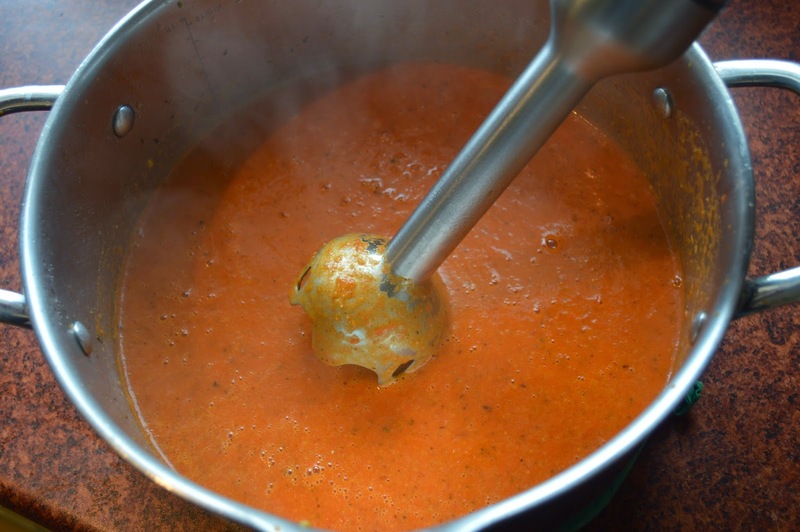 Using an immersion blender or a regular blender, puree the soup until the texture is uniform with no chunks. Taste and add salt to taste. Serve with grilled cheese croutons, if desired.